Posted on Sat, Aug 13, 2011 : 5:58 a.m. The proposed mixed-use development project, The Gallery, has been sidelined since the site plan was approved in 2006. 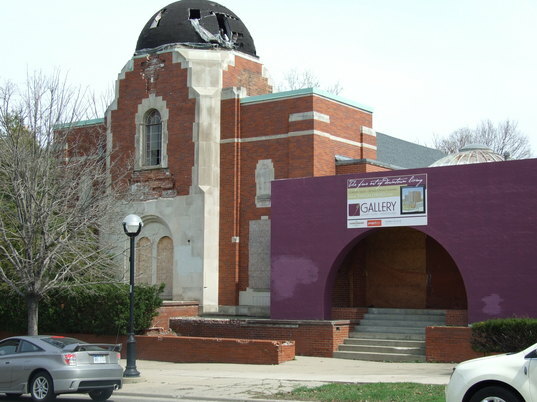 Developers of The Gallery, a sidelined condominium project on North Main Street, recently submitted a request to the city of Ann Arbor for a site plan extension. The project for a $67 million mixed-use, 11-story condo tower at the site of the dilapidated Greek Orthodox Church building first received approval from the city in 2006. The site plan was already extended once in 2009 for two years, said Wendy Rampson, the city’s planning manager. The project was sidelined for several years due to financial issues, including when a lender went to court in 2010 to collect a $2 million debt on the property. Huntington National Bank sued North Main/Fourth Ventures LLC, the ownership entity led by Ann Arbor developer Michael Concannon; his business partner Paul Sieben of Ohio; and 414 N. Main St. LLC, an entity led by Mel VanderBrug of Bloomfield Hills. The extension, which would keep the plans for the project alive for another two years, would allow the developers “time to bring the project to market,” according to the amendment. Concannon’s LLC bought the property — which includes the former church, the adjacent parking lot and vacant property at 401 N. Fourth Ave. — in 2005 for $2.35 million. Concannon planned the 11-story high-rise facing North Main, with 95 condos, ground-floor retail space, a floor of offices and 213 underground parking spaces. A four-story building with retail and 18 apartments was planned for the Fourth Avenue property. However, a troubled real estate market delayed the project as Concannon sought investors and negotiated with the bank for construction financing. Concannon declined to immediately comment on the request for a site plan extension. Sun, Aug 14, 2011 : 4:03 p.m. This project was horrible to start with, out of scale with the surrounding neighborhood. Now it turns out that it is in completely incompetent hands; the area is equally threatened by the lack of upkeep of the existing building. The City should absolutely deny any extension. The old church, which has been allowed to deteriorate beyond salvage, should be torn down and for now additional parking would be preferable to what is there right now. Eventually someone, hopefully with a better vision and, hope beyond hope, with an architect who is not a hack, may propose something economically viable that will not be an eyesore. This is an important space--it complements (or could ruin) the Kerrytown area, but also is part of the entrance to the city that in general needs improvement. Please do not allow any of the horrid architects who have been in competition for who can make Ann Arbor uglier wreck havoc with this spot as well! Sun, Aug 14, 2011 : 12:55 a.m.
Another one of the Hieftje's &quot;visions&quot;! God save us all from &quot;visionary&quot; crackpots and their minions on council. Cast them all out on their rears at the earliest opportunity - we can get at least one of them in November! Sat, Aug 13, 2011 : 11:02 p.m. Sadly, it will probably be a very, very long time before this project is economically feasible. Not sure what the best way out is going to be but demolishing the existing structure and tidying up the site is a good start. Perhaps that ought to be a condition of any site plan extension? Sat, Aug 13, 2011 : 9:38 p.m. Anyone that sees a better use for the property should simply buy it. Then, work with the city &quot;system&quot; for several years to devise an approved site plan. Arrange your financing. Buy the property. Build your dream. Take the risk to make money or not. There's plenty of direction and criticism from non stakeholders and non doers. There's ample opportunity for anyone here to do better. What? No takers. No one is surprised. Pity any property owner that lost their development financing in the the real estate bust. Lost demand has not returned. Financing is still scarce. A viable site plan is a precious commodity. Take it away and watch the property blight for another decade. Pull the site plan? The city and its residents will be harmed most. Sat, Aug 13, 2011 : 11:05 p.m.
Financing is scarce because banks used taxpayer bailout money to pad their bottom line and now refuse to make loans that could help the economy. Sat, Aug 13, 2011 : 9:58 p.m.
grateful for what? for rotting properties? you gotta be kidding me! the owners need to keep the property up while they own it. i dont give a hoot if poor poor mr. real estate has lost some opp in the downturn. thats life and thats bizzzness. and takin care of yo bizzzness is part of it. Sat, Aug 13, 2011 : 7:50 p.m. It appears to me that the &quot;inexperienced&quot; author of this article did not do her research homework. She should have looked at the history and ownership of this project as well as other projects by this developer as mentioned by the other comments. She should have checked the ownership of the related parcels with the Washtenaw Equalization Dept., City of Ann Arbor Assessor's Office, and performed a Business Entity Search with the Michigan Dept. of Licensing and Regulatory Affairs web site. These are all open to the public online, such as the project on Liberty &amp; Maple! Searched for: LIBERTY &amp; MAPLE, LLC ID Num: B1961J Name:LIBERTY &amp; MAPLE, LLC Type: Domestic Limited Liability Company Resident Agent: MICHAEL J CONCANNON Registered Office Address: 1785 W STADIUM STE 202 ANN ARBOR MI 48103 Mailing/Office Address: Formation/Qualification Date:3-19-2003 Jurisdiction of Origin:MICHIGAN Managed by: Members Status: ACTIVE Date: Present I think that it is high time that ANN ARBOR.COM makes the effort to train its staff to become true investigative reporters and not just &quot;run of the mill&quot; repeaters of information. Do the hard investigative research before writing a story! Sun, Aug 14, 2011 : 10:50 a.m. Sat, Aug 13, 2011 : 10:39 p.m.
Why would a completely different development have anything to do with this one? One does not have anything to do with the other. Should she also research successful ventures he has been involved with? Journalism is reporting the FACTS, not everything that has any connection a person involved in a piece to fit your narrative. The facts were presented, YOU are free to research it and discuss it with your elected officials. Sat, Aug 13, 2011 : 2:49 p.m. I thought A2 wasn't &quot;business friendly&quot;. Sounds like maybe we are way too friendly with some favored business. Sat, Aug 13, 2011 : 2:03 p.m. The authorities at the city for enforcing these situations take a hands off approach towards laggard developers. The problem is that the same people who ask for breaks are the same ones who complain about the process and scream government overreach when the hammer comes down. Sat, Aug 13, 2011 : 12:58 p.m. They have had 5 years and nothing has been done to improve the site, it is worse. If they were given an extension it should contain conditions to make immediate esthetic improvements, and have a heavy nonrefundable tax deposit if they don't comply that can be kept, say 10 million dollars. They need to put their money where their mouth is or stop dragging their feet. Sat, Aug 13, 2011 : 12:31 p.m.
...and the same developer who has left a condo/townhouse project unfinished at the corner of Pauline and Liberty? Enough already. Sat, Aug 13, 2011 : 10:59 p.m. The condos @ Liberty &amp; S Maple are indeed another defunct Concannon Project. Sat, Aug 13, 2011 : 1:57 p.m.
Pauline and Liberty do not intersect. You're thinking of the intersection of South Maple and Liberty a couple of blocks west of Stadium on Liberty. I may be mistaken bu I don't think Mr Concannon was involved with that abandoned building. Sat, Aug 13, 2011 : 11:45 a.m. This developer seems to show up in print with problems for each of his projects. Haven't we recently heard much the same regarding one of his other proposed developments? Sat, Aug 13, 2011 : 11:30 a.m. Isn't this the same developer who defaulted on The Dakota Building on Stadium? And left a gaping maw on Main St in Saline? Sat, Aug 13, 2011 : 11:28 p.m.
Yep! Luckily the creditors took ove the Saline property. It took a few month but their finally grading and seeding the property. It's what needs to happen here. Sat, Aug 13, 2011 : 10:57 a.m.
Five years of blight is enough. Please deny the extension and require the owners to either build the project, completely clean up and rent out the former Greek orthodox church or tear it down and leave the space clean and empty. North Main Street is a corridor of blight: the church, the burned out and roofless houses at the corner of Summit (belonging to the owners of the Near North project), the rotting structure on the north side of Summit and Main, the former Rock Band School and two houses behind it on West Summit where the dirties housed and hoarded, the run down liquor store on the south side of Summit and Main. Enough is enough. If developers want to buy property then they should be required to keep it up until they build or be fined so heartily that they feel motivated to do so. Sat, Aug 13, 2011 : 2:51 p.m. I'm certain the Main Party Store would love a 7-11 there! Sat, Aug 13, 2011 : 1:11 p.m.
Maybe they could seize it and sell the location to Cracker Barrel!